I am so excited to participate in the Crafty Destash Challenge this month! I started digging through my craft supplies trying to come up with ideas and found a package of plastic paint palettes that I had bought for the grandkids to use and here they were still in the unopened package. But they did spark an idea! I’ve been working on redoing the grandchildren’s bedroom at our house. One of the things I’ve planned is for one wall to focus on their creative endeavors including canvas paintings by each of the grandchildren. 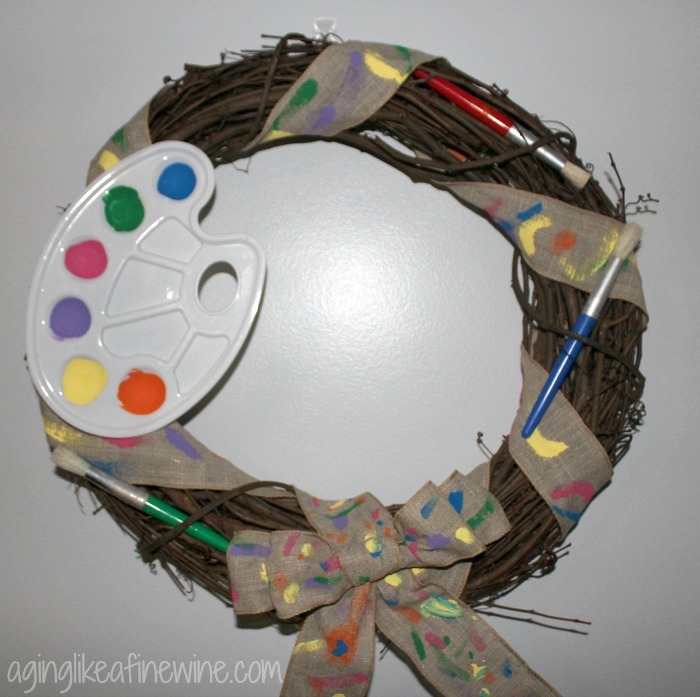 So now my thought is to do an artsy wreath with the paint palette and some brushes attached. Read more…. Interior wall painting made easier with this one simple to make tool! 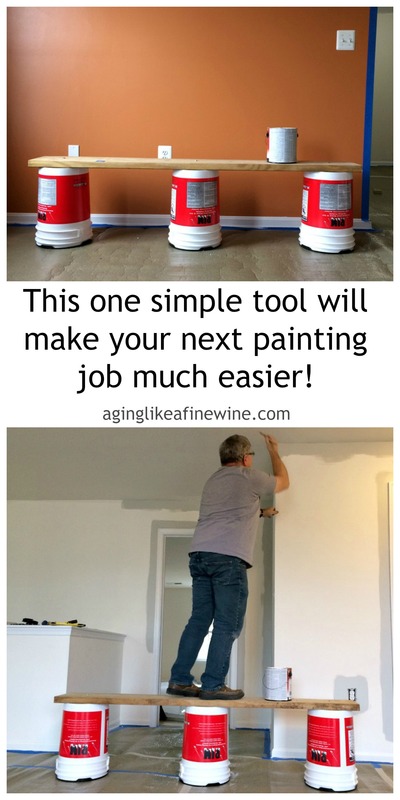 Whether you’re still in the prepping stage or have moved on to the painting stage, this simple homemade tool will make your painting life easier! How? No more climbing up a ladder and precariously leaning over as far as you dare, stretching with your paintbrush, hoping to get paint on just a few more inches before you have to climb down and move the ladder over. Only to once again risk life and limb as you climb the ladder and teeter on the next to the top step stretching as far as you can with that paint brush or roller. Read more…. Painting Wood Furniture…From a Lonely Corner at the Habitat for Humanity ReStore to a Beautiful TV Armoire! In a recent foraging trip to the local ReStore my eyes fell upon an old TV armoire and I was instantly in love. My husband Paul was with me and wasn’t quite as impressed with it as I was, until I managed to share my vision for it in a way that he could appreciate! Refinishing or painting wood furniture isn’t something we are experienced with, but he agreed, purchase was made and we wrangled the big piece of furniture home. Read more…. 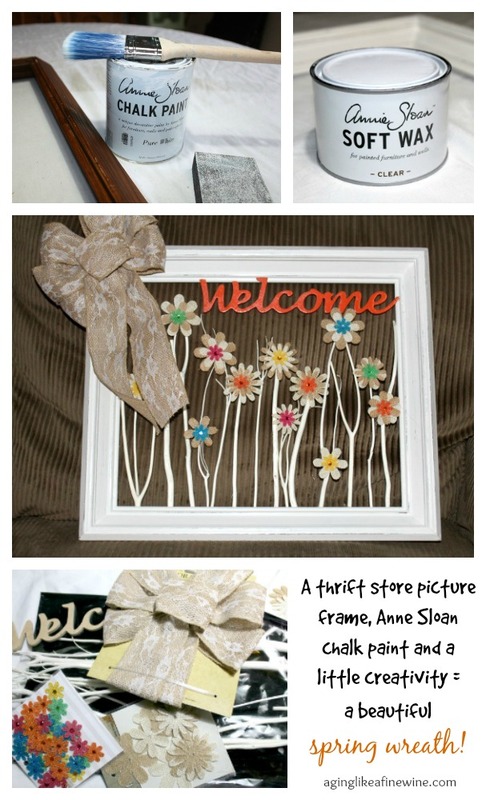 Give Your Front Door an Eye-Catching New Look With This Unique Wreath! With spring and warm weather arriving I wanted a new look for my front door; something different and more unique than the typical round wreath. So I headed to the thrift store to see if anything would catch my eye. What I came home with was an old picture frame and visions of what I wanted to do with it. Read more…. Create a Beautiful Table Vignette with this Macrame Table Runner! Have I said before that I’m thrilled that macrame is back in style? I am, I’m totally thrilled! I’ve been working on a macrame table runner, but because I’ve had too many projects going at once, it took awhile for me to finish it. Now that it is finished, I love it! Read more…. A portable lemonade stand you’ll actually have room to store! Do your kids want a lemonade stand, but you’re balking at the idea because you don’t have anywhere to store it between uses? That was my thought when I decided to build this portable one for my grandkids. I’m at a place where I want to declutter my home and my life. I am so tired of “stuff”. Do you feel that way? The longer you live in one spot the more “stuff” you seem to acquire. We had been planning a yard sale for a few months timed in conjunction with a community wide yard sale held every year. 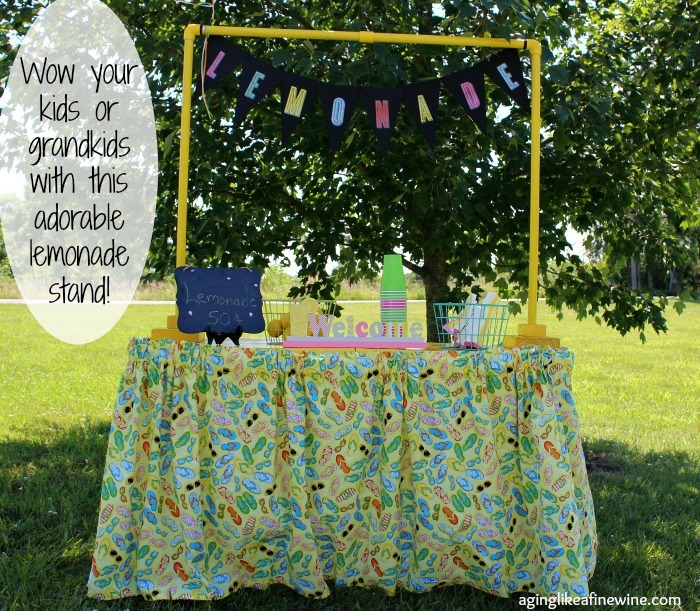 I wanted the kids to have a lemonade stand, so I started thinking about a way to make one that could easily be put away for another time. Read more…. Do you have a home near the beach, or just love nautical home decorations? Or perhaps you need a special gift for someone else who does? 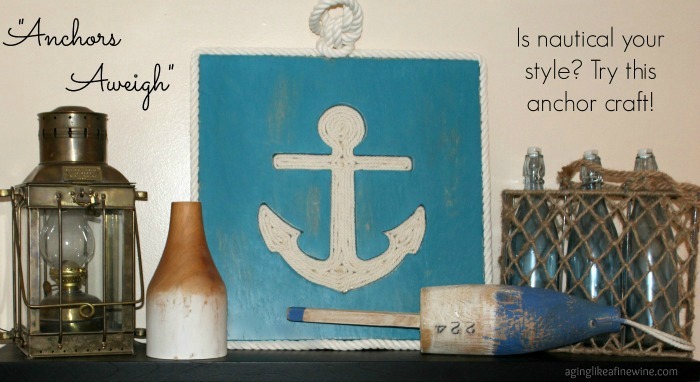 Make this wood cut-out anchor craft! I would love to have a home close to the beach. I would decorate it completely nautical and stroll the beach every morning or evening looking for anything the sea happened to have washed ashore that I could add to my collection. I don’t have that home near the beach yet, but that doesn’t mean I can’t keep dreaming! Read more…. 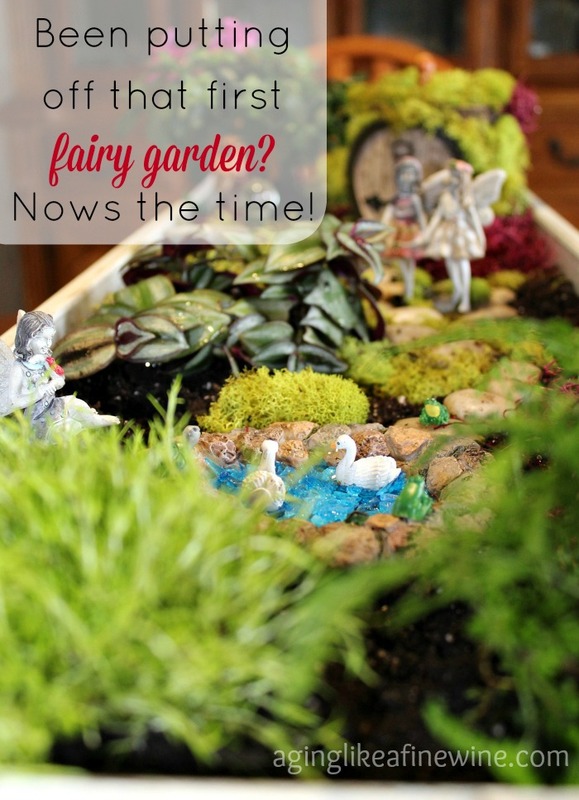 Considering your first fairy garden? Have you tried your hand at making a fairy garden, or maybe a gnome garden yet? If you’ve been looking at all of the cute gardens on Pinterest, but feel intimidated about making your own, just jump in and give it a try! With every craft or DIY project I make, I compare myself to others and feel inadequate. In my eyes my projects never turn out as good as all of the others I see, however like most of us I’m my own worst critic! So if we’re making it for ourselves and our home, aren’t we the only ones we have to please? And won’t we improve with each attempt? So, with that thought in mind, I just completed my second fairy garden! Read more…. 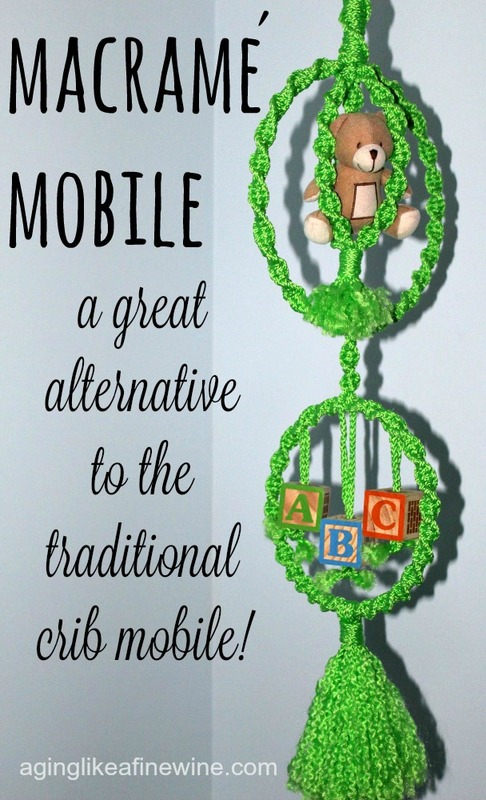 Replace your old crib mobile with this easy to make Macramé version! Trade in your traditional baby crib mobile for this easy to make macramé mobile that can be used long after the baby starts to pull his/her self up in the crib! The typical crib mobile, though usually very pretty, can only be left on the crib until the baby starts pulling up, then off it comes. Very short lived for the money we pay for them! I wanted to make something that wouldn’t have to be taken down when Read more…. 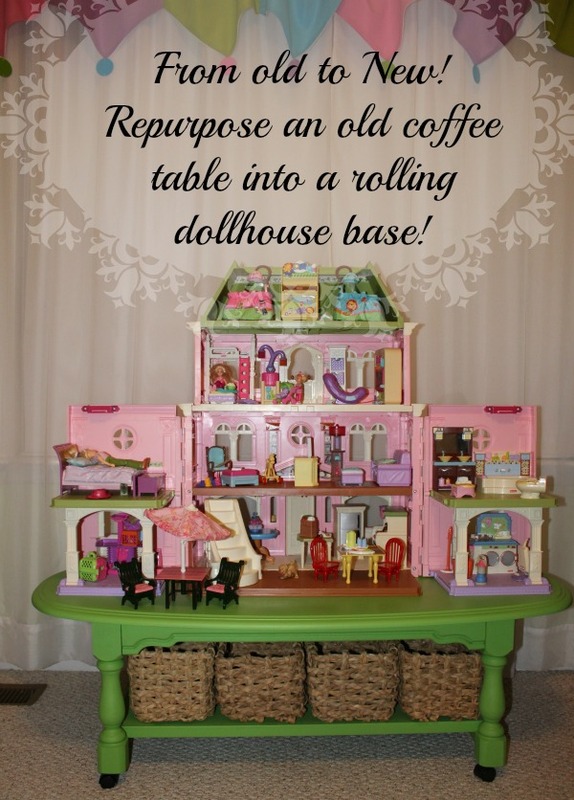 Repurposing an old coffee table into a rolling base for toys! Do you ever feel like some of your kids or grandkids toys just aren’t worth all your effort? I admit I do! And it happens to be the toy that my 5 year old granddaughter loves to play with the most. It is the Fisher Price Loving Family dollhouse, complete with all of the furnishings. The dollhouse requires being opened up and the furniture carefully and lovingly arranged in each room to fit the make believe world of the day. 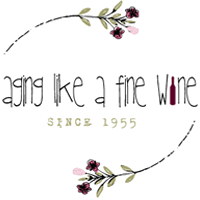 Then when it’s time Read more….